Hello, and thanks to the Mad Hatter for inviting me to stop by the blog. Michael suggested I might talk about the cultural influences in The Winds of Khalakovo, and I was glad he did, because it's something that's central to the novel and not something I get to talk about in depth too often. The first culture people will notice in the book is Russian, more specifically, Muscovite Russia, the time of the Czars. One reviewer called it a Cyrillic culture, which I rather like. I've been asked a few times: why Russian? I can't really remember the specific, "ah-ha" moment, but I do know that the decision spring-boarded off of the world I'd already created. I used a mapping program called Fractal Terrains to generate the world. The program allows you to specify various things about a world—like the diameter, how much land area, how many moons, how hot, how arid, etc.—and it then calculates via fractals the various land masses. You can even regenerate the world with the same parameters, but new seed values for the fractals, to generate a new world. I did this over and over until I'd found a loose gathering of islands that I liked. (If you're curious, you can view the maps here.) These became the individual Duchies of the Grand Duchy. I had already decided that the islands would be pretty inhospitable—cold, strong winds, and unmerciful seas—and these basic parameters reminded me of Russia. The western European histories we've all read a thousand times before held no allure for me whatsoever, but a Russianesque culture seemed like something fresh, so I decided to explore it further, and as you may have guessed, it ended up working well for the story I wanted to tell. It was a lot of fun for me to fill in the culture. I always used the touchstone of Russia with her cold, hard winters for inspiration. The closest I've been to Russia is Helsinki, but the people there seem to be no-nonsense, do-what-it-takes sort of people. They have a warm side that is difficult to reach, unless you happen to have some vodka on hand, and then the dancing and singing can begin. The military was one of the places where the Russian influence shined. The long cherkesska coats and kolpak hats of Cossacks circa the eighteenth and nineteenth centuries made for a unique play on military forces of the islands. I also liked fleshing out the political structure based loosely on the Grand Duchy of Moscow. Each archipelago has anywhere from two to ten islands. One unique aspect of the world is that the Dukes and Duchesses rule side-by-side. The Dukes fill the traditional role of ruler of the military might. They also work on trade agreements with the other dukes to further the interests of their Duchy and the Grand Duchy as a whole. But the Duchesses fill a unique role. They are not just royalty, they are also Matri, women who submerge themselves in ice-cold water fed from subterranean springs to enter a dreamlike state in which they communicate with other Matri. The place they go is called the aether, and it lies between the material and spiritual worlds. Because of their unique abilities, and because travel between the Duchies is so difficult, the Matri are the medium through which the Duchies most often communicate. They hold as much power as the men. In effect they run the business of the Duchies, including arranging for marriage, where the men work toward longer-term arrangements and accords. The second culture that people will notice is Persian, or something akin to it. Some people have mentioned that the Aramahn and Maharraht in Winds remind them of the Bedouin culture, others Afghan. None of these is incorrect, as I was trying to capture not just one culture specifically, but a tapestry of subcultures. The Aramahn are a nomadic people. There are permanent communities, but they exist more as places for the Aramahn to land from their worldly travels and share knowledge. Like any large culture, it will eventually fracture, and this is seen in several different ways in Winds, from the ways in which they view the Grand Duchy to the ways that they view their lot in life. Perhaps not so obviously, the belief system of the Aramahn is based off of Buddhism, not Islam. They believe in reincarnation and striving for enlightenment. It is their most fervent goal: to find oneness, if not in this life, then perhaps the next. When the people of the Grand Duchy pushed eastward onto the islands, however, it presented a problem. The islands had long been a refuge, a place of peace for the Aramahn, but the Grand Duchy—the Landed, as they came to be known—were ruthless in their pursuit of land and resources. Many of the Aramahn merely accepted this and searched within themselves for answers to these troubling times. Others felt as though they couldn't take it anymore, and they fought back. These people became the Maharraht, a splinter group of the Aramahn who believed that they had to fight the influence of the Grand Duchy so that the rest of the Aramahn would not have to. They knew they were setting themselves back on their way to enlightenment, but they felt the price was worth it. If they could not reach enlightenment, then perhaps their brothers and sisters could. The clash of these three cultures—Anuskaya and the Aramahn and Maharraht—is largely what The Winds of Khalakovo is about. I spent a lot of time fleshing this out ahead of time, and more time during the writing of the book, to really detail what each wanted, what they desired. But not only this. I wanted each of them to be imperfect. I wanted there to be exceptions—shades of the primary color, if you will. This, to me, is the most satisfying part of the book: the exploration of culture through the eyes of the main characters. The brightest scenes for me are where these things come head-to-head. The last primary culture in the world of Erahm is not very present in the first book, but it's touched on here and there. I mention it because it becomes a major influence starting with Book 2, The Straits of Galahesh. The Empire of Yrstanla lies to the west of Anuskaya on the only large continent in the world. It is called the Motherland, the place from which humanity sprung. The Empire is a place that is somewhat feared on the islands, for her power is great, but she is currently embroiled in several wars on her western borders, and so for the time being Anuskaya is safe. In The Straits of Galahesh, we get to know the Empire much more intimately as she once again turns her attention to the islands she once ruled. 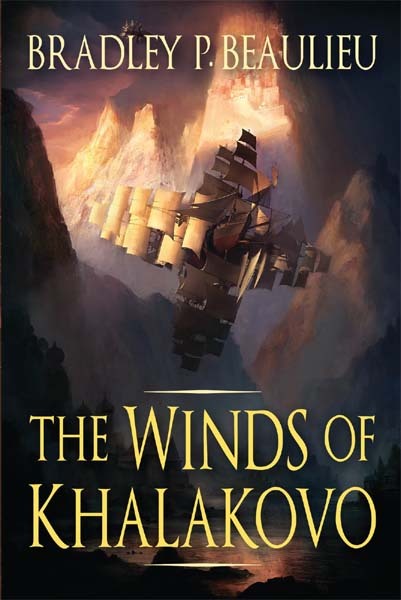 I hope that gives a bit of insight as to the influences of the cultures in The Winds of Khalakovo. If you'd like to learn more about the book, please visit my webpage at www.quillings.com. Again, my thanks for Michael for inviting me. great post! loved learning about the behind-the-scenes of a book. now, i'm excited to read it! Agreed, great post! It's nice seeing the behind-the-scenes of what the author was thinking while putting the story together. Personally, I like the big focus being on how these different cultures collide, if you will. Also, the Matri and the aether sounds pretty sweet!